It's over, Anakin! Your opponent has the high ground because they read my blog post on how to climb and clamber! That’s Not How the Force Works is my look into the confusing rules of Legion and attempting to sort them out in the easiest way possible. Since the Rules Reference for SW:L is a living document, things may change! Hopefully not too quickly, though. No sweeping Star Wars landscape would be complete without something tall breaking the horizon: a tree on Endor, perhaps, or a moisture vaporator on Tatooine. And Legion is no exception, where bits of terrain with various heights are crucial to an interesting gameplay experience. But unlike other qualities of terrain, such as cover and movement difficulty, height is objective, not subjective. To round out our multi-week exploration of terrain in Legion (although certainly not the last we’ll hear on the subject), let’s talk a bit about terrain height, climbing, and clambering. How Do We Measure Height? Simply put: with a range ruler. Stand one of your range rulers up on its base, and place it next to the terrain. If the highest accessible point of your terrain falls squarely in Range 2, then that terrain maxes out at Height 2. If the highest accessible point is within Range 1, it’s Height 1. And if your terrain has multiple accessible points at different heights, they should be measured independently. So a single piece of terrain could potentially require multiple climbs to fully scale. And how do we get on top of terrain? By climbing or clambering. First things first: only troopers can climb or clamber. Luke, Vader, Rebel Troopers, Stormtroopers, all good. AT-STs? Not so much. 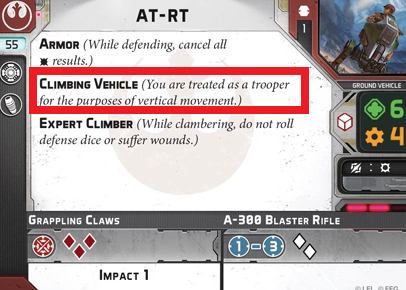 But if a unit has the “Climbing Vehicle” keyword (as shown below on the AT-RT), it too can climb. Climbing takes two move actions (or essentially a full turn) to scale up a maximum of Height 1. In order to be eligible to climb, a trooper unit leader must be able to sit flat on the piece of terrain, and must have the rest of its unit (if applicable) in cohesion. Cohesion in this case is measured twice: first, horizontally with a speed 1 movement ruler (not a range ruler like we used to measure the height). Second, it must also be within range 1 (the range ruler, not the movement ruler) of the unit leader when measured vertically. This means that as long as long as a mini is within a speed 1 movement ruler’s length of its unit leader and within range 1 height, it doesn’t necessarily have to be at the same height as its unit leader. More simply: you can climb with part of a unit (including the unit leader) but not all of a unit as long as it meets those two conditions. Clambering is like climbing, but faster and riskier. Instead of taking two move actions, you only take one. But as a consequence you must roll one white defense dice for each mini in your unit. Then, take one wound result for every block result rolled. In a pinch, clambering might be the more strategically sound option. You must also clamber if you are climbing up to height 2. Like climbing to height 1, clambering to height 2 takes two full move actions. Then, you roll two white defense dice for each mini in your unit and take a wound for every block result. 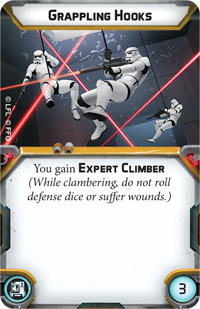 But there’s always a way out: cards that grant you Expert Climber (the AT-RT gets it natively, as seen above) can prevent damage from clambering altogether. Jump X is an action that acts like a regular move, but allows you to ignore terrain height up to X. 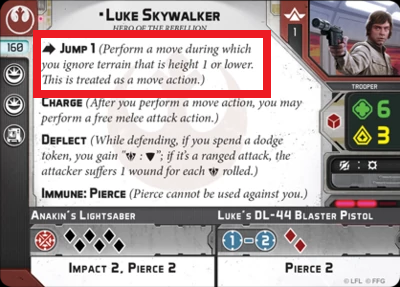 In the case of Luke, with Jump 1, he can at any time do a regular move but jump up to or over anything at height 1 or lower. Speeder X allows vehicles (right now just the Bikes and Airspeeder) to ignore height at X or lower, but also mandates a compulsory move to begin your activation. If you can’t complete that compulsory move for whatever reason, you take wounds equal to your speed – which is a devastating blow for the Bikes, especially! When a unit clambers to move up or down ladders, steps, or carved footholds, it does not roll dice or suffer wounds. Players should define these areas of the battlefield in Step 2 of setup. So while height itself is not subjective in the same way some aspects of terrain are, players can determine whether or not a piece of terrain has a feature that would allow units to clamber without needing to take damage. As the explanation says, this can only be defined in the game’s setup, not mid-match. So look carefully over your board before the game begins, especially if you plan on making use of its vertical features!